The National League Central may wind up being one of the most compelling divisions in baseball in 2019. The Brewers are the reigning champions, the Cubs are coming off a 95-win campaign and the Cardinals added Paul Goldschmidt to a team that was in contention until the final days of the regular season. Elsewhere, the Pirates managed a winning season last year, and the Reds have been among the most active of teams this offseason. No surprise, then, that the SportsLine Projection Model expects a tight race for the crown among the Brewers, Cubs and Cardinals. Now let's narrow in on the two storied blood rivals of the division -- the Cubs and Cardinals. These two have been exchanging barbs this winter, half-joking or otherwise, but that's not really enough of an appetizer. Consider this a call for both St. Louis and Chicago to get in on the Bryce Harper derby, however belatedly. Consider it to be an even more urgent call now that Manny Machado is finally off the board. 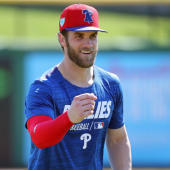 Sure, if the current buzz is any guide, then the Phillies are the heavy favorites to land Harper. Until ink is on paper, though, he's available for hire. So even though camps are open and Cactus and Grapefruit League play is in the offing, the Cardinals and Cubs should shift course and set the plains afire in righteous pursuit of one of the most coveted free agents in history. That's a very good season at the plate, thanks largely to Harper's home run power and his willingness to take walks. It's also a step or two below the customary Harper season. He's seen wide performance swings in his big-league career, ranging from "otherworldly" (his MVP season of 2015) to "merely good" (2014 and 2016). The upside, though, is undeniable. As well, Harper is just 26 years of age, which means he fits a team's near-, mid-, and long-term aims. He's not a one-year fix, and he's not someone you need to wait on for further development. The team that signs him will no doubt be betting that he hits that MVP-caliber season at least once or twice more before his next contract is up. Even if Harper doesn't, though, he's still a useful player even at his demonstrated worst. Right now, the Cardinals are projected to open the season with a starting outfield of Harrison Bader, Marcell Ozuna and Dexter Fowler. The hope is that Ozuna's power will return to customary levels after finally undergoing shoulder surgery. Bader, even if he continues struggling against right-handed pitching, is playable thanks to his elite defense in center. Fowler, though, is a trouble spot. Fowler is going into the third year of an $82.5 million pact that took a turn for the worse last season. In 2018, Fowler missed time with injury and when healthy slashed a listless .180/.278/.298 (59 OPS+) with eight home runs in 90 games. That's obviously unacceptable production, doubly so for a corner outfielder with a declining glove. The question for the Cardinals is whether Fowler can be expected to bounce back to adequate levels in this, his age-33 campaign. To get an idea of how likely that is, we'll turn to an advanced metric called expected weighted on-base average (xwOBA). xwOBA grows out of wOBA, which assigns proper value to every possible offensive event that happens while a batter is at the plate. Those proper valuations of singles, doubles, homers, walks, etc., distinguish wOBA from more traditional measures like AVG, OBP, and SLG. Also, for simplicity wOBA is scaled to look like OBP, which means that, say, .400 is elite and .290 is pretty poor. For instance, Babe Ruth is the all-time leader with a patently absurd wOBA of .513. All of that brings us back to xwOBA, which is an estimation of what a hitter's wOBA should be based on things like exit velocity off the bat and launch angle. xwOBA attempts to strip away luck -- bad or good -- and defensive play from wOBA and identify a hitter's baseline skill. It's useful for getting an idea of how a hitter figures to perform in the near-term future. Basically, if a hitter's xwOBA is significantly lower than his wOBA, he's probably going to come back to earth at some point. There's some evidence that slower players tend to underperform relative to their xwOBA and faster players tend to overperform, but even so xwOBA has utility. On the other side of things, if a hitter's xwOBA is quite a bit higher than his wOBA, then better days are likely ahead. In Fowler's case, last season he put up a wOBA of .261 and an xwOBA of .274. So he was probably a bit unlucky last season, but even if he'd put up his "deserved" wOBA he would've still had a terrible season at the plate. The Cardinals need more of a bounceback than that. Can Fowler as he creeps toward his mid-thirties give them that? It seems like a big ask. The various and sundry projection systems are going to be more bullish on Fowler since his 2018 depths are lifted up by the remaining balance of his personal recent history. SportsLine, for instance, tabs him for a line of .217/.304/.375. That's better, but it's still not what St. Louis needs from this bat-first position. Harper would give the Cardinals a much-needed dose of left-handed power, and since St. Louis is roughly $45 million under the luxury-tax threshold they have enough room to sign Harper without incurring any penalties. As for Fowler, he's one of the genuinely good guys in the sport, but the odds are long against a return to high-level production. The Cardinals, with so much riding on 2019, need to eat his contract and spring for the upgrade. The addition of Harper would make them consensus NL Central favorites. You can argue that Machado would've been as much of a fit on the north side of Chicago, but so much for that. Anyhow, the Cubs have Kyle Schwarber in left, a mix of Ian Happ and Albert Almora Jr. in center, and Jason Heyward in right. This obviously isn't a team strength, and Heyward profiles as the weakest of those. Heyward enjoyed a mild bounceback at the plate last season, but a hot June is doing a lot of the heavy lifting with his 2018 numbers. SportsLine projects Heyward in 2019 to bat .261/.329/.402 with 12 home runs. At the OPS level, that's an exact repeat of his 2018. That's not terrible by any means, but a source of concern is that Heyward's previously stellar fielding showed signs of decline last season. That could be just single-season noise, or it could be a sign of things to come. Whatever the case, Heyward's bat is unlikely to carry anything less than plus defense on his part. Cubs owner Tom Ricketts was asked why more money wasn't invested in the on-field product this off season (Bryce/Manny etc) : "That's a pretty easy question to answer. We don't have anymore." Sure, the Cubs have probably run up against their allotted budget limits for the offseason, but that's an artificial barrier in the extreme. The Cubs, of course, have an embarrassment of riches in terms of revenue streams and can afford any free agent at any plausible price. Per Forbes valuations, this is a team that's worth almost $3 billion, that has more than $450 million in annual revenues, and that registered an operating income of more than $100 million last season. As well, the luxury-tax penalties aren't really all that steep for first-time offenders (the Cubs barely stayed under the threshold last year). In the truest sense, "We don't have anymore," can be read as "We have chosen not to have anymore." There's simply no reason the Cubs shouldn't be moving aggressively to win the World Series for a second time in four seasons. To be sure, they might still do that. The Cubs are a strong bet to top 90 wins yet again, and in most quarters they're regarded as the division favorites. Signing Harper, though, could drastically upgrade their outfield situation and provide some separation from the Cardinals and Brewers. Adding Harper would likely give the Cubs the highest payroll in baseball, but, well, they can afford the highest payroll in baseball while still remaining wildly profitable. Heyward of course still has more than $100 million on his contract. A trade would perhaps be workable provided the Cubs are willing to kick in millions, or he could be viewed as a handsomely compensated fourth outfielder. Or maybe Heyward is the solution in center. Whatever the means to clear a path for Harper, the Cubs should make it happen. It's hardly unrealistic to think that Harper, Bryant, Anthony Rizzo, Javier Baez and Schwarber could combine for 150 home runs in the same lineup (the Cubs hit 167 as a team last season). That, in turn, is a fine start toward fending off the Brewers and Cardinals in the NL Central.